Fishing is another popular pastime in Oregon, and visitors can get in on the angling action, as well. Trout, crappie and bass are just three varieties of fish that can be found in the Tualatin Valley’s rivers, lakes and ponds — it’s some of the best and most diverse fishing you’ll find near Portland, Oregon. The 1,100-acre man-made Henry Hagg Lake, located in a forested area in Gaston near Scoggins Valley Park, is a popular fishing hole. Open to motorized and non-motorized boats, as well as swimmers, Hagg Lake is open for day use only (dawn to dusk), March-November. Canoes, small fishing boats and pedal boats may launch at Boat Ramp C, on the west side of the lake, along West Shore Drive. (Catch of the day: crappie, bluegill, trout, largemouth bass, rainbow trout, yellow perch). Gales Creek is one of the best-kept secrets for anglers. This spot is a great spot for trout fishing. Campers can overnight at the Gales Creek Campground, situated along a river for prime fishing and fly fishing. (Catch of the day: trout) . Horning’s Fishing and Picnic Hideout is a multi-activity attraction that offers fly fishing and cast and lure fishing, along with disc golf and hiking. No license is needed to fish in this private, well-stocked four-acre lake and pond. Overnight tent and RV camping also is available. (Catch of the day: rainbow trout). The city of Beaverton boasts a number of ponds that are open to fishing and are perfect for a quick fishing activity. These ponds and lakes are located in residential areas and are close to other amenities. Bethany Pond (West Union Rd. and 185th Ave., Beaverton) is located in the Bethany neighborhood, this small pond is stocked with trout in early spring and warm-weather fish year-round. (Catch of the day: trout, largemouth bass, crappie, bluegill, bullhead). Commonwealth Lake (Cedar Hills Blvd. and SW Foothill Dr.) is located in a neighborhood park, and is stocked with a variety of fish. This lake is known for its kid-friendly fishing and ADA-accessible areas. (Catch of the day: trout, bass, bluegill, crappie). Progress Lake (Barrows Road, Beaverton), located in the Progress Ridge neighborhood, is the newest stocked lake in Beaverton. This deep lake is only open to dock fishing and features a floating fishing platform. (Catch of the day: trout). Need to stock up on fishing supplies? The new Cabela’s (7555 SW Nyberg St., Tualatin; 503-822-2000) stocks a large variety of fishing gear and clothing, including poles, lures and more. 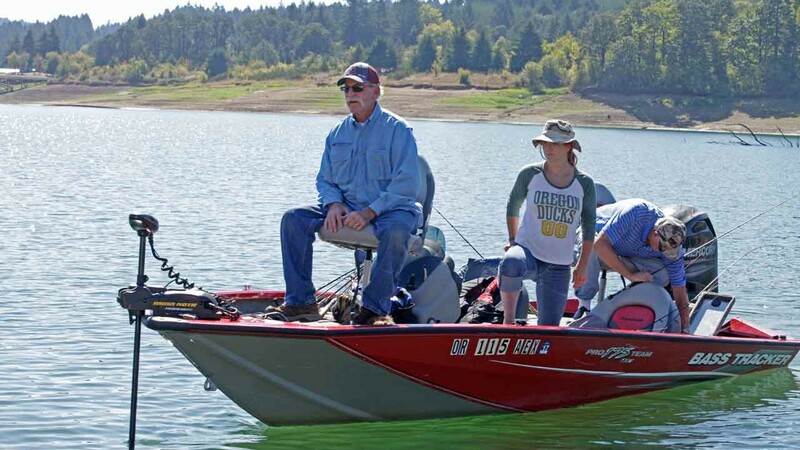 On the way to Hagg Lake, Lake Stop Grocery (8015 SW Old Highway 47, Gaston; 503-357-4270) also has items needed for a day of fishing. NOTE: Anglers older than 13 years must have a valid fishing license, available from the Oregon Department of Fish and Wildlife (ODFW) (or call 503-947-6000). Licenses start at $9 for a juvenile license, $33 for an angling license.